National Nurses United, with more than 150,000 members nationwide, is the largest union and professional association of registered nurses in U.S. history. NNU was founded in 2009 unifying three of the most active, progressive organizations in the U.S.—and the major voices of unionized nurses—in the California Nurses Association/National Nurses Organizing Committee, United American Nurses, and Massachusetts Nurses Association. 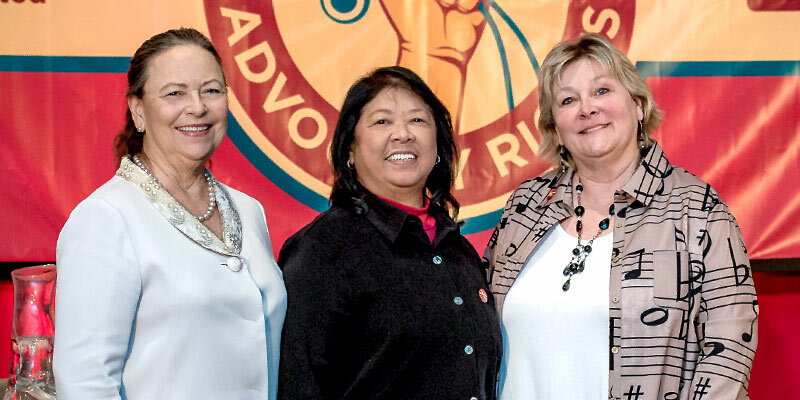 NNU's executive director is Bonnie Castillo, RN and its presidents are Deborah Burger, Zenei Cortez, and Jean Ross. Combining the unparalleled record of accomplishments for nurses and patients embodied in the proud history of those nurses associations, which for some span more than 100 years, the establishment of NNU brought to life the dream of a powerful, national movement of direct care RNs. Advance the interests of direct care nurses and patients across the U.S.
Organize all direct care RNs "into a single organization capable of exercising influence over the healthcare industry, governments, and employers." Promote effective collective bargaining representation to all NNU affiliates to promote the economic and professional interests of all direct care RNs. Expand the voice of direct care RNs and patients in public policy, including the enactment of safe nurse to patient ratios and patient advocacy rights in Congress and every state. Win "healthcare justice, accessible, quality healthcare for all, as a human right." Organizing 6,500 RNs into NNU in Florida, Illinois, Iowa, Nevada, and Texas. Sharing collective bargaining resources and experiences to support major collective bargaining campaigns in Minnesota, Washington DC, and other sites. Sponsoring major national legislation to promote comprehensive reform for patient safety and professional nursing practice, including RN-to-patient ratios modeled on the successful California law sponsored by NNU affiliate CNA. Strengthening the voice of RNs in the national healthcare reform debate, and in electoral campaigns from coast to coast. Most notably, CNA/NNOC sponsored the nation’s foremost RN patient safety law, in California, requiring minimum RN-to-patient ratios, the most effective solution in the U.S. for stemming the erosion of care standards in hospitals. NNU affiliate members are renown as leading advocates of guaranteed healthcare by expanding and updating Medicare to cover all Americans, for negotiating many of the best collective bargaining contracts for RNs in the nation, and for sponsorship of innovative legislation and regulatory protections for patients and nurses.